Early Gaelic Harp Info: Simon Fraser and Angus Fraser, their manuscripts and published books. The published arrangements are not highly regarded by connoiseurs of old native music. At the time of their publication, John Thomson wrote that “they are too florid for national melodies, and in many cases they are not at all characteristic, i.e. they have not the peculiar Highland accent which would stamp them as real national Highland airs” (printed in the Celtic Magazine, vol.4, 1879). Malcolm MacFarlane said it was “spoiled music” (TGSI 32, 1925). The manuscripts represent more material that was being prepared for publication. They generally contain melody lines of old Gaelic song tunes. Some have fiddle-style variations although these may be Angus Fraser's own compositions. Also there are comments on some of the tunes. 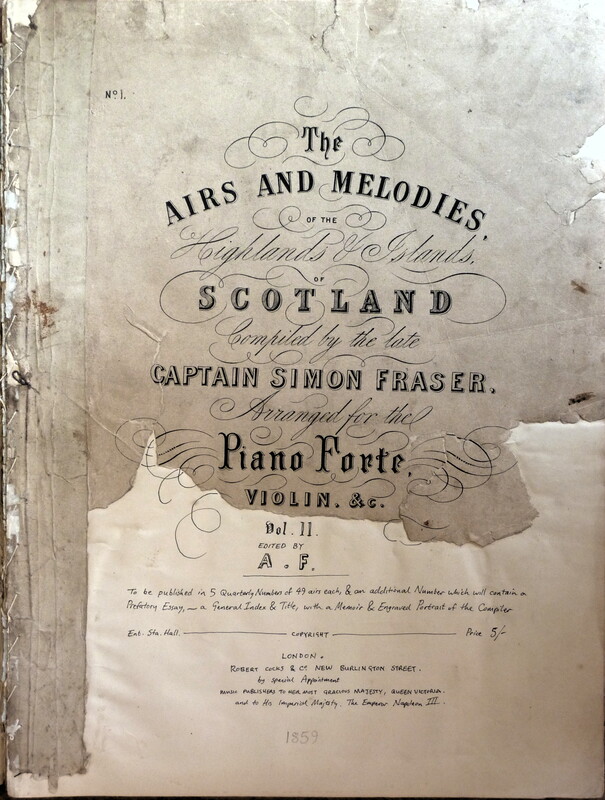 Angus Fraser’s manuscripts have had an unfortunately high profile in surveys of old Scottish harp music, since Frances Collinson in 1966 described them as "the only seemingly authentic Scottish harp music ever to be recovered" (The Traditional and National Music of Scotland, p.266). He writes this in his conclusion, where he is effusing about the possibilities of future research and discovery. However in the chapter on the harp he is a lot more cautious, though he still does put a lot of weight on these manuscripts (p245-248). His unfortunate quote above is likely wrong on two counts: first that the instrumental variation sets written out by Angus Fraser are most likely not at all genuine harp music, but are newly composed work for fiddle, in a pseudo-ancient style, and second, that there is plenty of other Scottish harp music preserved, as Collinson himself describes on p.243 and as catalogued here in this section of this website. A collection of song airs arranged with treble and bass. Facsimile of the 1874 2nd edition available from the Emporium. More piano arrangements of tunes and song airs. The title page promises 5 quarterly numbers, each with 49 airs, plus an additional number with introduction, portrait and overall title page. Only part 1 seems ever to have been published. Angus worked to complete his father Simon's collections, but his manuscripts were never published. This edition by Taigh na Teud though incomplete, presents many of the tunes, given in melody line only. These sources are very difficult to use as sources for Gaelic harp tunes. Most of their content is Gaelic song airs, many of the older of which may have been originally sung with harp accompaniment. In both the mss and the printed book, they have been heavily arranged according to 19th century scholarly taste; the book includes lush piano basses and plenty of accidentals to push the tunes into major and minor keys, while the manuscripts have Angus Fraser's variations that he seems to have made up according to his theories of ceol mor. Other versions: Dow: Mari nighean Deorsa - Mary the Daughter of George. Allan Macdonald (Thesis p.223-228) connects this tune to the song “Moladhair Pìob Mhór MhicCruimein” by Alasdair MacMaighster Alasdair, and the pibroch “March for a Beginner” in Joseph MacDonald’s Theory. In A&M Vol 2 part 1, are three tunes whose titles are connected to the above, but the melodies less so. No. 40, Clàrsach fhir Shèugallaidh (Sheugly’ harp), No. 46 A Phiob-Mhòr Ghàidhealach (The great Highland bagpipe) and no. 47, An fhiodhull (the violin). All three are quite chromatic tunes, unplayable on pipes or harp. This is Táim i mo Chodladh in Bunting ms29; Neal; Burk Thumoth etc. A lot has been written and recorded about this tune and/or title, with speculation that it is a harper’s song air, or the oldest or the most significant, piece of ceol mor for the Gaelic harp, and that it is the missing link between early Gaelic harp music and pibroch. All of these claims are most likely completely bogus. Angus Fraser wrote out the tune in his manuscript “with its characteristic variations revived for the piano forte” (these variations are not printed in the TnaT edition). He seems to have combined the tune of ‘an Leannan Sìth’, with the title ‘Craobh na teud’ of a pibroch pipe tune of similar melodic shape, and to have added his own “characteristic variations”. William Matheson in his edition of the poems of Rory Dall Morrison claimed that Rory Dall’s poem ‘Féill nan Crann’ fitted both the title and the melody of ‘Craobh na teud’. However this claim seems to be extremely unlikely, as Alasdair Codona has pointed out: “The lyric of Féill nan Crann suggests more than one possible musical metre and the metre of Craobh nan Teud is just not one of them” (Clairseach message 1096, 23 Feb 2009) - quite apart from the two titles being completely different. TnaT edition p.15 / ms ? Angus Fraser’s version of this tune is somewhat different from the set given by Oswald and MacFarlane, being less flowing and tune-like. In the TnaT edition, it is given as three sections which seem to me to be three of Angus Fraser’s “characteristic variations”. We may be missing the melody in this source. TnaT edition p.69 / ms ? This version from Fraser and Dow is a different tune to the Lament for the Bishop of Argyll in MacFarlane. Other versions: archive recording of performance, SSS SA 1963.19.A2, not yet online at Tobar an Dualchais. William Matheson (The Blind Harper, 1970) suggests this is the air for Rory Dall Morison’s song, Creach na Ciadaoin. He lists some other airs that may be connected to this song, and comments on their similarity to each other. William Matheson (The Blind Harper, 1970) suggests this is an air for Rory Dall Morison’s song, Oran do Mhac Leoid Dhun Bheagain.